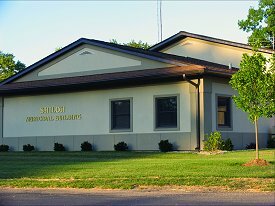 The Village of Shiloh operates under a Mayor-Trustee form of government. The mayor and 6 trustees are elected at-large in non-partisian elections. The trustees and mayor serve a four year term, their terms are staggered so only three trustees will be elected every two years. The Village Board acts as the policy making body for Village government and the mayor serves as the chief administrative officer. Numerous private residents also participate by serving on committees and commissions to review issues of interest to the community. These residents make recommendations to Village officials and are considered an important part of the governmental process. The Village of Shiloh was featured on KSDK, the NBC affiliate in St. Louis. See what they had to say about our beautiful Village!